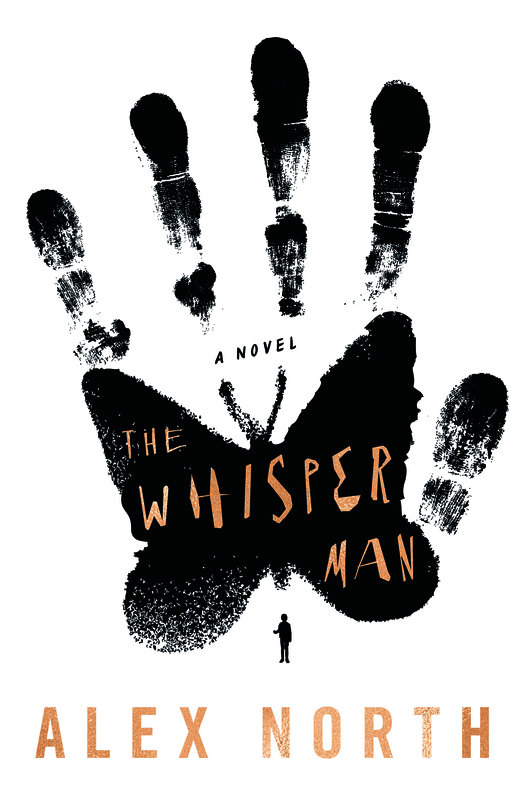 Be among the first to read The Whisper Man by Alex North, a Shelf Awareness Galley Love of the Week. Presented on Mondays, GLOW selects books that have not yet been discovered by booksellers and librarians, identifying the ones that will be important hand-selling titles in a future season. I raced through book two of this series (book one here). Boy, that last one was a long review, wasn’t it? I’ll try and be more brief this time. To start with: I’m definitely hooked on The Expanse. Caliban’s War keeps Holden and his deeply likeable crew at its center, while Detective Miller is nearly absent, having flown off to Venus with the protomolecule version of Julie Mao. 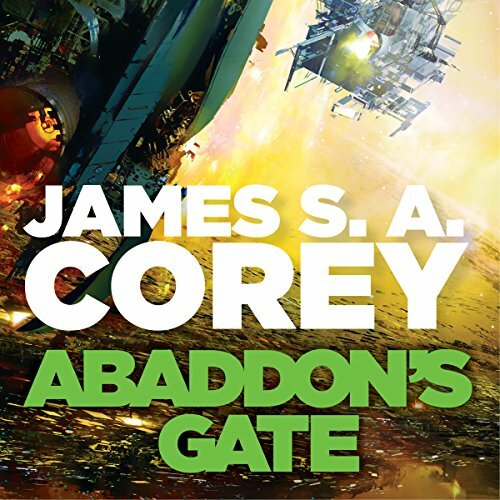 Tor.com’s article on this volume (which, again, I found an excellent guide) says that “Holden is the through line, but only in a way that centers things for the reader. He’s really a vehicle for everyone else,” which I think is nicely put. A few new characters enter the spotlight. Prax, or Dr. Praxidike Meng, whose daughter has been kidnapped, is a meek botanist big on brains and short on street smarts. I occasionally found him maddening, but he makes an interesting contribution to the little family that is Holden’s crew. He also, through the crisis of his missing child and her link to the protomolecule, provides the novel its central one-off storyline. Chrisjen Avasarala is a UN (Earth) politician, and a delightfully nuanced character with all the backstory required to make her interesting and believable; she could carry a whole book on her own. And Sergeant Bobbie Draper of Mars is like a female Jack Reacher: huge, badass, clever and loveable (as long as she’s on your side). Avasarala recruits Bobbie, and the two of them work together to try and avert disaster in the tenuous cold war between Earth, Mars and the Outer Belt following the events of book one. Although Wikipedia calls Holden, Prax, Avasarala, and Bobbie the four main characters of this book, I think that sells Holden’s crew short. His love affair with Naomi is progressing, with its issues. Alex is offscreen for part of the story, and receives somewhat less character development, but Amos is coming right along. The friend who turned me on to this series calls him a psychopath, but I think that’s not the least bit fair. He cries for children in danger. I love Amos. And the family togetherness of the crew of the Rocinante (Holden named it) is a sweet point – approaching saccharine, actually, but I seem to have a high tolerance for that, once I’ve bought in. And I’ve definitely bought in here. My endorsement of this series continues. It’s sci fi for people who care more about people than the science. It’s right up my alley, action-packed but also all about character development and human conflict and feelings. On to the next one. This was a definite departure from my usual reading, in part because it was listening and not reading. 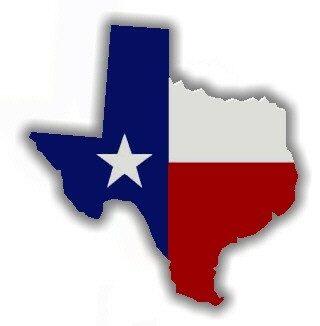 Two life changes contribute: one, that I live in a van now, and do a fair amount of driving, therefore time to listen. And two, I graduated! and have far fewer reading commitments, so I thought I might have brain-room for audiobooks again. Yay! This was also a genre departure. 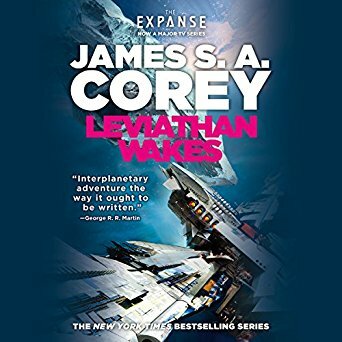 A friend set me up with The Expanse series on audio, highly recommended. He calls these books “hard-boiled film noir in space,” which all rings true, although I would have said sci fi as a first-level categorization. I did a little research and reading around as I wrote this review, which is fairly unusual, but I’m so unfamiliar with the genre that I felt at a loss. I am glad I poked around like I did. I learned, in this article from Tor.com, about the “space western” sub-genre, which made instant sense for Leviathan Wakes even before I read the full description of that genre distinction. On the other hand, it was interesting to note in that article that its author found Miller a trying character and was always anxious to get back to Holden. 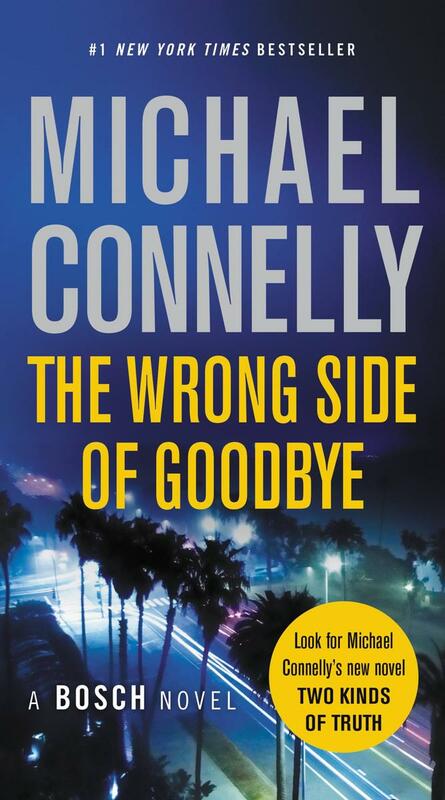 While I can’t say the opposite – I certainly found Holden compelling – I did feel Miller was sympathetic and genuine. Some people really are that depressed, depressing, and self-sabotaging. Or maybe it’s just that I love noir mysteries, with their disturbed PIs. But I’m getting ahead of myself. Leviathan Wakes takes place in a future in which humans have colonized Mars and a good chunk of the solar system. The major political players in this world are Earth and Mars, with an outer asteroid belt roiling and muttering rebellion under the name OPA (Outer Planets Alliance), which has been labelled a terrorist organization by the major powers. In this setting, we have a handful of protagonists, chiefly two men: James Holden, Earthborn captain of a commercial ship and former officer in the United Nations Navy, and Joe Miller, a rundown Beltborn detective and classic noir figure (his wife left him, he drinks too much, he’s dysfunctional but still has a good heart). There’s also Holden’s crew, Naomi, Amos, and Alex; and Julie Mao, rich girl turned OPA fighter, who we meet only briefly at the beginning of the book. She becomes a missing person and Miller is assigned (by nontraditional means) to find her. He becomes obsessed. This is a hard plot to summarize because a lot happens (the paperback is some 600 pages, the audiobook 21 hours). If you want more, the Wikipedia page does a pretty good job of summary, but beware spoilers there. I’ll turn to another’s words again: Aidan Moher, the writer at Tor.com, praises this book “for being open and approachable for anyone with even a remote interest in science fiction, but specifically for those who are intimidated by the hard science that often forms the backbone Space Opera. It focuses instead on the intricacies of the human machine — relationships, anxieties, dreams, loss, redemption, acceptance.” Well put, and explains why I was able to enter so easily into this world. Human relationships, etc., are definitely my main interest in literature. I had a great time listening to this one. I felt pulled in by the momentum of both character development and plot; it stayed entertaining always. There were a few elements I let slide by me: the tech (and anything I missed was not a problem), and also the lovely patois spoken by Belters, which mixes a few languages (English, Spanish, Hindi, and more: there’s a great page here). That pidgin language offered great color and I felt like I understood enough to get along. (I’m often a fan of foreign languages used in English writings, where context clues or cognates give me enough to get by, and I’m generally able to trust the author that what I miss is unnecessary to my understanding of the larger work.) In other words, I thoroughly agree with Moher: this was an easily accessible sci fi novel that I loved for its human elements. Despite being a longish book, pacing was snappy, and the alternating viewpoints of Holden and Miller kept things lively as well. 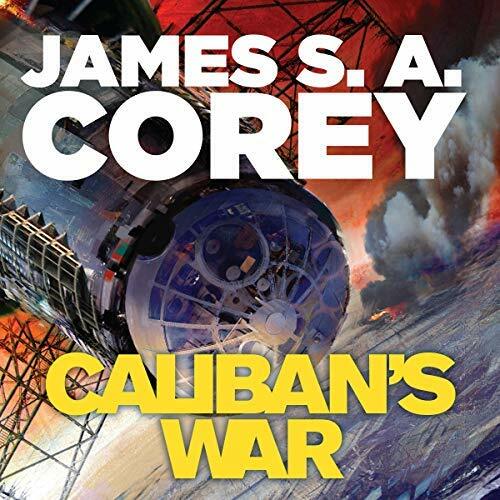 I am absolutely looking forward to the next book in the series, which is Caliban’s War. Stand by: I’m going to switch gears in a big way and listen to some Stegner next, and then back to the old space western. My friend who has given me the series tells me this one will be “more horror and psych thriller,” with which I am right on board. Thanks for the hook-up, Paul. My date for this movie called its hero a female Jack Reacher. He’s right and he’s wrong. 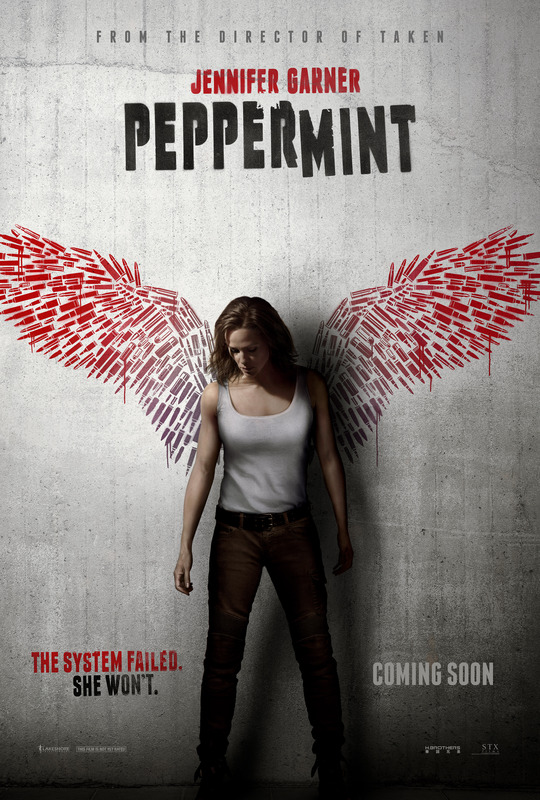 The plot of Peppermint reminded me of The Brave One. That 2007 movie starred Jodie Foster as a woman recovered from a coma to find that her fiancé had been killed in the same attack that left her hospitalized. She becomes a vigilante, taking her own justice against those who wronged her as well as other wrongdoers in the community. In this one, Jennifer Garner’s husband and daughter are killed in front of her; she disappears for five years, trains to become a badass, a vigilante, and comes back to take her own justice against those who wronged her as well as other wrongdoers in the community. On the plus side: Jennifer Garner is ripped and she is beautiful and I like her. The fight scenes and blow-em-up scenes are exciting, and I didn’t notice anybody firing forty-seven shots out of a magazine that holds twelve rounds (as is so common on my beloved show The Walking Dead). As pure adrenaline-excitement-thriller, this one satisfies. On the minus side, quite a few things. Garner’s character is not developed. She loved her husband and child – we can easily trust this, but that’s pretty much all of her personality that we know, and it’s not much of a personality; it’s something most people with spouses and children carry, in fact. We don’t get to see any of her training to become the badass that we see onscreen. A single line of dialog by (if memory serves) an FBI agent describes her training in foreign countries, but it’s a very brief line. The actual becoming – a critical piece of growth, and that which makes this movie – takes place all off-screen. I’m thinking of Kill Bill here, and how it showed Uma Thurman’s character gaining her skills: that’s an important part of the story, movie people! To put it another way: the plot of this movie is easily summed up in the single sentence I wrote above. Jennifer Garner’s husband and daughter are killed in front of her; she disappears for five years, trains to become a badass, a vigilante, and comes back to take her own justice against those who wronged her as well as other wrongdoers in the community. Pretty plot-weak, then. But successful as a blow-em-up thriller: for one thing, the weakly sketched plot tends to resonate with all of us (underdog wins; justice is served), and even with a sort of cheap version of feminism (Jennifer Garner has muscles and beats the men). Hollywood knows their formula. I enjoyed it, actually. My date enjoyed it even more. But a female Jack Reacher? No. 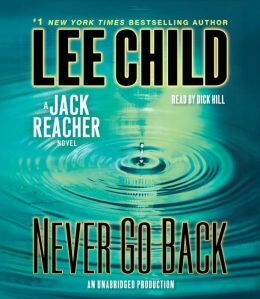 Reacher’s author, Lee Child, gives his hero copious backstory. His books have plenty of plot twists. And his strategies, methods, and skills are detailed and explained. The Reacher books are told in either first-person or a close third-person-limited perspective, meaning that we get to know what Reacher thinks and feels. Any of these elements would have done Jennifer Garner’s character so much good, in terms of depth. Still fun, though. Beautiful muscles on our heroine. Stay out of her way.